The word “Koan” is Japanese for a statement used during meditation. Frederick has adopted this paradoxical word to best describe our new Keyboard Bench. This bench tells a similar story of a thick and comfortable woven top in a bright crimson color attached to a sturdy hardwood frame and legs. 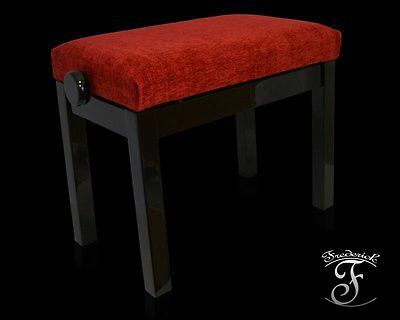 The bench features and adjustable rise along with a deep, high polish ebony finish. This piece would fit well into any modern art museum as well as any concert stage. We Accept Credit Cards: Visa, MasterCard, Discover and PayPal. Please call us if you would like a PayPal invoice sent to your email.